The book is 80 pages long and formatted to A4; 210 x 297mm. It contains over 120 high quality black and white photographs; plus 17 maps, numerous colour profiles, cut-away drawings and colour illustrations. 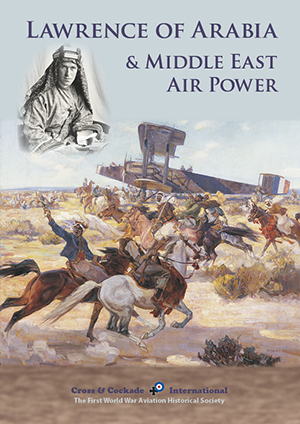 A hundred years after the start of the Arab Revolt, this ground breaking book offers new insights on the contribution of aircraft to the campaign and a fresh perspective on Lawrence of Arabia’s reputation as an air power theorist. Modern commentators refer to an ‘all arms’ approach to warfare. This collection of articles explores the use of air power in the Middle East during the First World War. It draws upon research done by Cross & Cockade International members over a number of years, updated with the latest research and new photographs, as well as specially commissioned articles marking the centenary of the Arab Revolt. The narrative describes the introduction of aviation in the Middle East, the wartime operations of the Royal Flying Corps in support of the Arab Revolt, and Lawrence’s contribution, in the years immediately following the First World War, to the development of the air route from Cairo to Baghdad that helped secure the independence of the Royal Air Force and formed the basis for the Empire Air Route to India and beyond. The book is 80 pages divided into 11 chapters. It contains 17 maps, over 120 photographs and a number of colour illustrations.